This 2015 live account of Handel’s enduringly popular Messiah was recorded at concerts in the Herkulessaal, Munich. Dijkstra has chosen the B'Rock – Belgian Baroque Orchestra Ghent, a period instrument specialist founded in 2005. From the video on the BR Klassik website filmed at these performances I can see that this ensemble numbers some thirty players. It takes its historically informed performance seriously using authentic instruments or period copies with the string section having gut and period bows, violins and violas without chin-rests, cellos without spikes, a theorbo, natural trumpets and horns and wooden timpani sticks. Out of a consistent cast of strong soloists, extremely well chosen, probably the most satisfying performance is that given by soprano Julia Doyle. There is a depth of purity to Doyle’s voice and with seemingly effortless delivery she expresses the text with unassailable reverence. Especially successful is the aria I know that my Redeemer liveth with its persuasive sense of consolation. Making a strong impression is Steve Davislim with his well focused and committed tenor. Notable are his accompagnato Comfort ye followed by the uplifting aria Every valley shall be exalted. These are splendid examples of his distinctive forthright style. He has a near baritonal quality that I find most effective though he may push too hard for some tastes. Counter-tenor Lawrence Zazzo gives a captivating performance marked by natural assurance, fluid and attractive tone and an innate feeling for the text. Zazzo relishes O thou that tellest and the lengthiest solo in the work, the beautiful He was despised, is sung with just the right level of introspection and piety. Without intending any detriment to Zazzo whenever I hear these two remarkable alto arias I instinctively recall the elevated level of engagement that contralto Kathleen Ferrier conveys in her 1952 Kingsway Hall, London recording with the LPO under Adrian Boult on Decca. Handel specialist bass-baritone Neal Davies responds vividly to the text with compelling involvement. His incisive and assured delivery is just what the part calls for. He sings with particular assurance in his solos Why do the nations so furiously rage together and the lengthy The Trumpet shall sound. Noticeable is Davies’s vibrato but it doesn’t intrude unduly. Renowned for his work with choirs and vocal ensembles Dijkstra’s experience shines through like a beacon in this lively reading. He clearly has a perceptive ear for rhythm, phrasing and dynamic. Dijkstra frequently works with the Chor des Bayerischen Rundfunks that numbers 32 members here. Right from And from the glory of the Lord the Bavarian chorus are remarkably fresh and bright, singing perceptively with ideal weight and bite. The justly celebrated Hallelujah Chorus sounds as inspiring as any version I have heard. Combining security of ensemble with sensitivity to the accompaniment of the text it is hard to fault B'Rock in a performance graced with fluency, polish and tonal beauty. Some of the individual contributions are unforgettable especially the remarkably unshakeable accompaniment by the principal trumpet to the bass-baritone solo The Trumpet shall sound. I was also struck by the enchanting obbligato lines of the leader’s violin which throughout conveys an engaging musical sensibility. The sound quality is excellent revealing ample detail together with a gratifying balance. I notice that the sound engineers have taken out the applause and there is little in the way of extraneous noise to worry about. Beautifully presented as usual by BR Klassik there is a lavish booklet in the slipcase with an informative essay by Alexander Heinzel together with full English text and German translation. We are treated to information about the orchestra and choir yet curiously there is nothing about the quartet of soloists except photographs. My first Messiah was a pre-authentic practice account recorded in 1959 with Sir Malcolm Sargent conducting the Royal Liverpool Philharmonic together with the 100 or so strong Huddersfield Choral Society on Classics for Pleasure. For overall impact that recording still packs quite a punch. Today there are a number of excellent recordings in the catalogue. 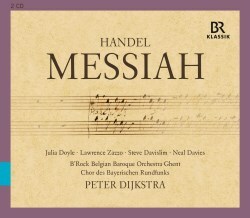 I usually turn to Paul McCreesh from 1996 and Trevor Pinnock from 1988 both on Archiv Produktion; nevertheless this magnificently performed release by Peter Dijkstra can rub shoulders with such exalted company.